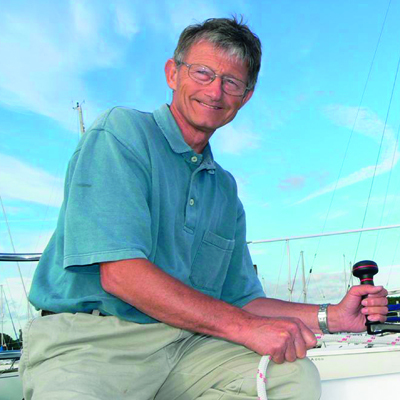 Ex-merchant navy officer Alex Bell sails a Bénéteau First 305 and lectures in maths and engineering at Southampton Solent University. With the end-of-season lay-up approaching, it’s a good time to consider how best to keep the interior of a yacht free from damp and consequent mould over the winter months. I have used a dehumidifier on my boat for many years, but last winter I loaned it to someone whose boat had mould problems caused by an en suite shower. With no dehumidifier to deploy, it was me who ended up with mould on my boat headlining for the first time in years! 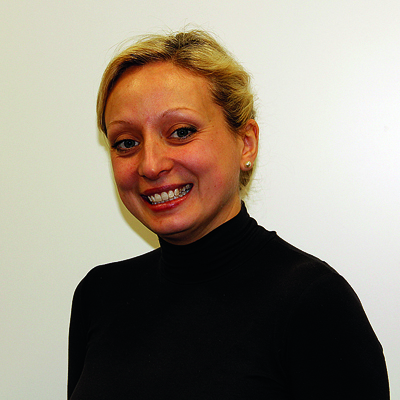 Mould will grow in damp conditions where the relative humidity is greater than 68%. Similarly, iron will rust with humidity above 50% and steel above 80%, so engines and tools become vulnerable to the moist air. 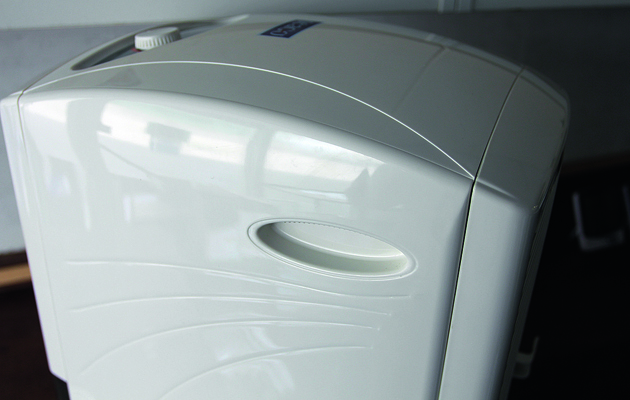 Chandlers and product websites recommend dehumidifiers suitable for boats and caravans. What they all have in common is that they are compact machines and don’t come with castors. They require mains electricity, so they can only be used where a suitable shore supply is available. If, like me, you lay your boat up on a cradle, consideration has to be given to carrying the dehumidifier up a ladder. In this situation, light weight and a good handle are important factors. There are two types of dehumidifier to choose from: compressor or desiccant. The compressor type works in the same way as a refrigerator or air conditioner. Gas (the refrigerant) is compressed, then cooled to a liquid state at high pressure in a condenser. It then passes through a constriction (the expansion valve) into a low-pressure region (the evaporator), where it converts back into a gas. During this process heat is required, and this cools the gas and its surroundings. Air drawn through the dehumidifier passes through this cold region, and moisture in the air condenses on the exterior of the heat exchanger plates and runs downwards, through gravity, to a collection point. Compressor models use less electricity than desiccant dehumidifiers. But in cold weather the moisture in the air freezes on the cold plates and the dehumidifier shuts down. 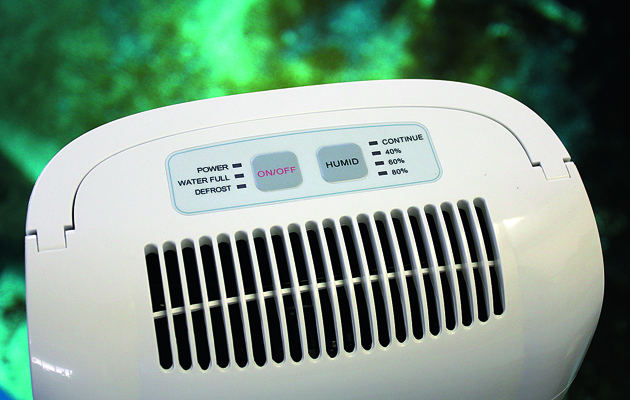 Compressor dehumidifiers work really well in hot weather, so they are ideal for your Caribbean lay-up! They are heavy, because they consist of an electric motor to drive the compressor, a condenser and evaporator, refrigerant piping and an additional motor to drive the air circulation fan. fan dry the wheel as it passes into the drying sector of its rotation. This moist hot air is then cooled by the incoming air in a condenser; the water extracted gravitates to the bottom and is collected in the same way as the compressor models. The dry air leaving the dehumidifier is thus much warmer (by around 10°C) than the air entering. So, desiccator models thrive on cold air temperature and also heat the space from which they are removing the moisture. This will warm the boat’s interior and help to prevent the domestic fresh water pipes freezing up. 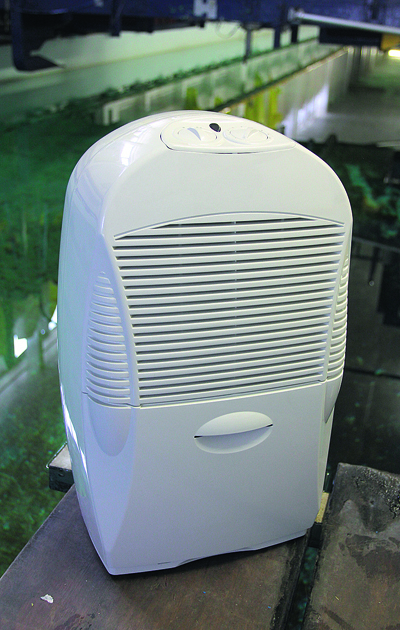 Desiccant dehumidifiers are also much lighter in weight than compressor models. However, they use more current than compressor models. They require operation in air free from solvents. Solvents (from resin or varnish) can affect the desiccant. 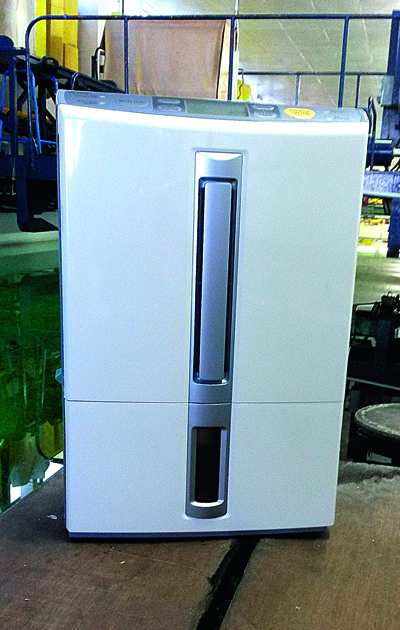 You can buy basic or sophisticated models of dehumidifier. Basic models will have a humidistat: this will switch the machine off when the humidity drops to a pre-set percentage. Though variable, you don’t really know what value this is. On sophisticated models you can set it, although they switch off anyway when the humidity is reduced to around 50%. All models collect the water in a container (the bucket). For some this is a translucent tank which enables you to see how much water has been collected. All have a cut-off switch that shuts the machine down when the tank is full, and a ‘full tank’ warning light. sink drain. All dehumidifiers will have an inlet air filter. These vary in quality, and some can be enhanced with carbon to neutralise odours or a biological element such as silver ion to kill microbes. The simple mesh filters can be cleaned using a vacuum cleaner soft brush attachment. Some carry handles can be folded out, while others are fixed recesses in the machine’s body. These fixed indents are not so handy if the unit needs two hands to lift it. Some machines have a laundry mode which puts them on optimum performance, and in some cases enables the warm outlet air to be directed towards damp hanging clothes, assisting their drying. A timer may be present that will allow you to set how long you want the machine to work. Another ‘extra’ is an ioniser. This delivers negative ions into the air that attach themselves to positive ions – fine dust particles, for example – making them heavy, so they fall to the floor where they can be vacuumed up. is reduced, but a check is still made on the level of humidity. Basic machines have a ‘continuous’ position which overrides the humidistat to keep the machine running regardless of the ambient humidity. A variable fan speed feature means you may be able to select a slower speed to quieten the machine down if you are in the room or cabin with it running. Good quality extension leads and surge protectors are recommended for any electrical device left unattended on a boat. This will guard against low voltage and high amperage of the incoming supply which could, in theory, cause a spark on a dehumidifier’s control panel. There are two Meaco desiccant models available: the DD8L and the DD8L Junior. Both look the same, the difference being the Junior doesn’t have an ioniser or anti-bacterial coating on the filter which makes it cheaper to buy. Common controls include an on/off switch, a three-speed fan control, a three-stage humidity control (maximum 40%, normal 50% and minimum 60%), a laundry mode (35%) and a timer which turns the machine off after 1, 2, 4 or 8 hours. The DD8L also has an ion button to turn the ioniser on/off. 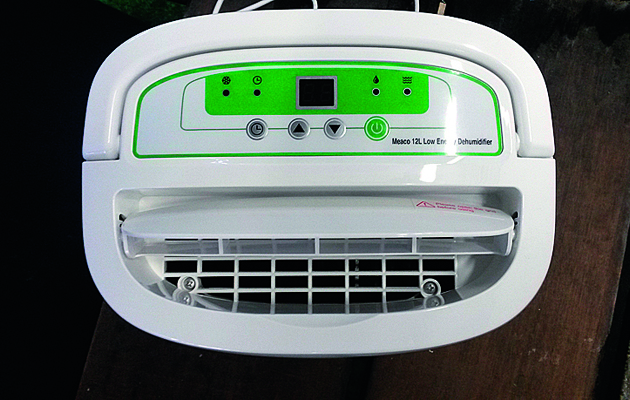 In the three modes controlled by the relative humidity stat, when the target humidity is reached, the dehumidifier will stop drying the air and run the fan for 10 minutes. The fan then goes to sleep for 30 minutes, then switches back on and samples the air, so it knows when to start dehumidifying again. The carry handle has a recessed grip at the back, and because the machine is light in weight (6.4kg) this works fine when carrying with one hand. An LED lights up when the bucket is full. The collection bucket comprises a rectangular translucent tray with a lid contained behind a door (which has a front viewing window). The rear panel also has a window, so you can view the amount of water collected from front or rear. Both models come supplied with a continuous drainage hose. The filter is a fine plastic net on a removable panel. 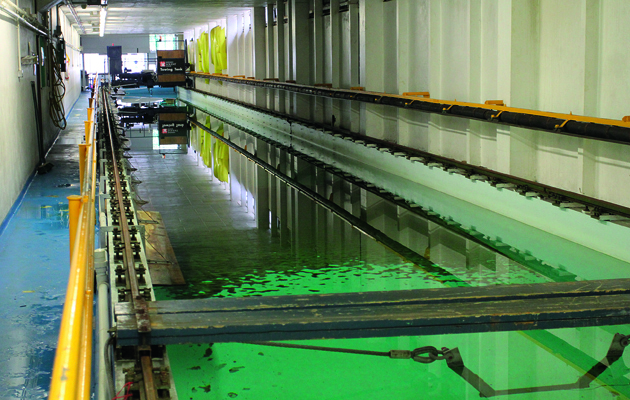 On test the two Meaco models collected more water than the others, with the exception of the Mitsubishi. 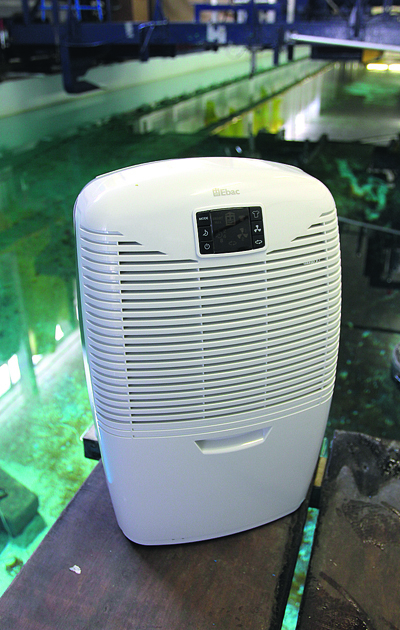 As with all desiccant dehumidifiers, they consume a lot more power than compressor models. 80% – pretty high – giving the machines plenty of moist air to work on. We set the machines on maximum output, and then measured how much water they’d collected over a four-hour period. We measured the power they consumed under maximum load and on standby. We also measured the outlet air temperature and humidity, using a combined hydrometer/thermometer. Ebac’s most advanced compressor dehumidifier comes with all the top functions, including an LED display and laundry mode.Controls are an on/standby/off button, a mode button which cycles between max (continuous running) and smart (which turns the unit on and off as required). A button cycles between two fan speeds and a laundry drying function. A timer can be set to run the unit for 2, 4 or 8 hours. 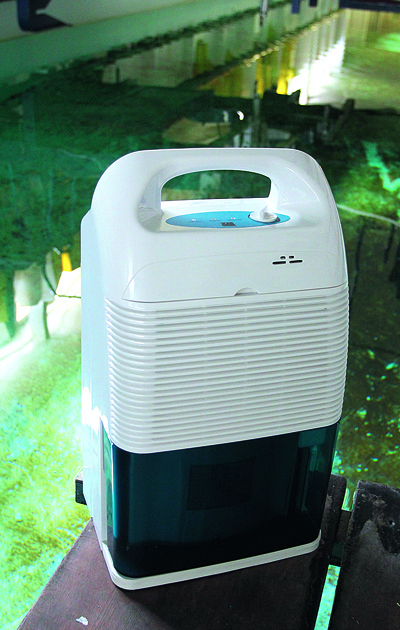 Purifying mode stops extracting moisture and just filters the circulating air. A smart control continuously monitors and learns about the environmental factors, so it knows when it needs to work or not. The filter, a single skin of coarse black foam, is contained at the rear of the machine. The opaque collection bucket is located behind a front-opening door and, like its Amazon 15 cousin, holds 3.5lt of water. Accessories include a drainage kit, replacement standard filters, a fragrance filter, and an activated carbon filter with Bactiguard. No carry handle is fitted: there are two shallow slots in the casing on each side, making it a two-handed job to lift and not suitable for taking up a ladder single-handed. On test Water collection and current consumption was average for the compressor models. It weighs a fairly heavy 13kg. Arguably in a class of its own, this compressor dehumidifier comes with features including an LED display of the air’s incoming humidity, full laundry mode and an electrically-controlled swivelling air outlet louvre on the top. 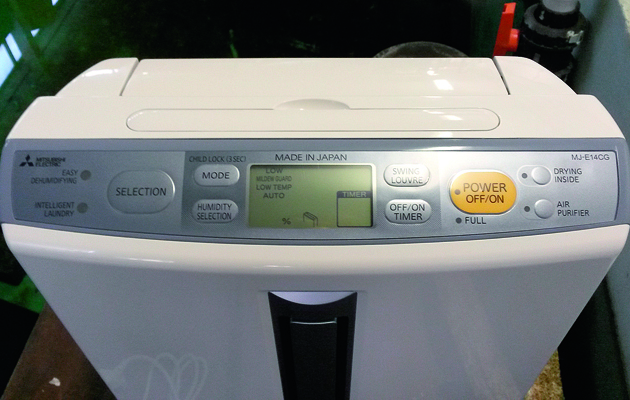 The controls comprise a button to select ‘easy’ dehumidifying or ‘intelligent laundry’ mode, humidity and mode selection with child lock, an LED display giving various items of information, a swing louvre to control how it operates, a timer button, power on/off, a ‘bucket full’ LED, a drying inside button/LED and an air purifier button/LED for just filtering air. 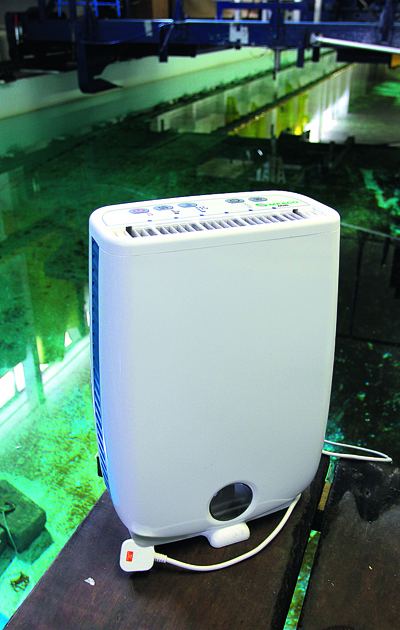 Easy dehumidifying mode operates the unit periodically as conditions demand. A door hinges to reveal a rectangular translucent water collection box with lid. The door also has a see-through panel to give a view of the water collected.The silver-ion-coated antibacterial filter is accessed by removing a panel above the bucket door. The carry handle neatly parks by dropping vertically down into the top. A very comprehensive handbook is provided. On test it collected the most water, but drew more current than the other compressor models. It is also fairly heavy at 11.7kg. This basic compressor model of the Ebac range has a body manufactured from ABS polymer and features two controls: one for the two-speed fan, the other for an electronic humidistat. A running light turns to red when the water container is full. An ‘intelligent’ defrost system predicts when the heat exchanger coils in the dehumidifiers are about to freeze and suspends the refrigeration process: this then allows the coils to defrost. of water, making it one of the largest ‘buckets’ on test. The standard filter is two-layer, including carbon. Accessory options include a permanent drainage kit and Bactiguard filters. The handle amounts to a large horizontal recess at the back, making it possible to carry with one hand. 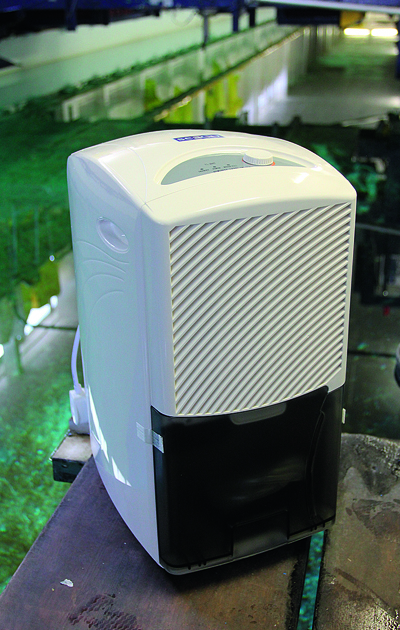 On test the Amazon 15 collected slightly less water than average and consumed average current for the compressor models. Weighing 13kg, it’s on the heavy side. 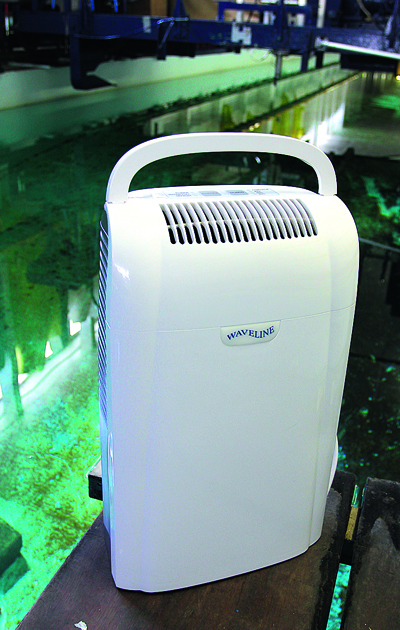 This was one of the lightest, most compact and least power-hungry of the dehumidifiers tested. Basic controls include a humidistat (calibrated to 40%, 60% and 80% humidity and a continuous mode), while two LEDs indicate bucket full and defrost mode. and there is a slot in the bucket to feed the hose through. This slot enables the power lead to be stored in the bucket when not in use. The filter, a rather delicate mesh, slides into position at the back. The unit has a large folding handle. On test the Waveline collected an average amount of water and had the lowest power consumption. At 8.75kg it’s one of the lightest models, and was also the quietest on test. A downside is that in the event of a power failure it won’t restart automatically. Adapted for use on board by virtue of having wheels replaced by non-slip feet, this dehumidifier’s basic controls include a combined on/off switch and humidistat control, and bucket full and defrost warning lights. A hose is included for continuous drainage, though we found the bung difficult to remove. Auto defrost mode comes on at temperatures below 15°C, where the compressor stops for 10 minutes every 40 minutes while the fan keeps running to remove frost on the condenser. The carry handles comprise two recesses – not ideal for carrying the unit up a ladder. lightest weight (8.5kg) of the compressor models. 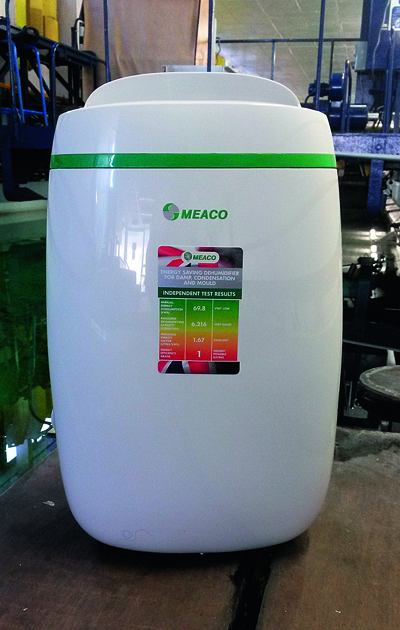 Meaco’s top-selling compressor model shares some of the best features of its desiccant cousins, having the same sampling sleep mode to regularly monitor the humidity. Differences include a digital display of the current humidity of the air entering the dehumidifier. The same display is used to set the required humidity level, using soft-touch buttons which also control a child-lock function. There are no viewing ports for the collecting bucket, but a hose is provided for continuous drainage. The 12L works on one fan speed and is rated at 165W. 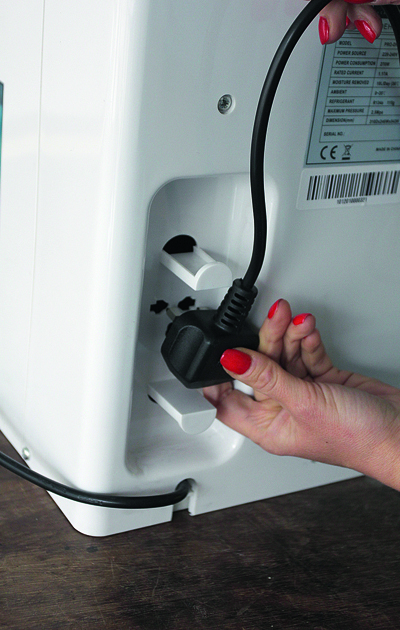 The outlet air is directed through a manually set louvre, located on the top, where you’ll also find a folding handle. The air inlet filter slots into place on the rear and can be cleaned with a soft brush on a vacuum cleaner. On test the 12L was only beaten for water collection by the Mitsubishi. For power consumption it was the second- least hungry, and it’s one of the lighter of the compressor models at 9.5kg. a rope to hoist it on board (for yachts on a cradle). With its large 3.5lt blue translucent integral water collection container, there is no mistaking how the set is performing. The bucket is easy to remove by sliding out, but can be fiddly to replace. Basic controls comprise a humidistat and a defrosting/bucket full LED. The air filter slides into position at the back – the fine mesh looks on the delicate side. in the water outlet above the collection tank. On test This was the highest-powered of the compressor models, but collected slightly less than average water. Its weight was about average at 10.5kg. It was a hot day when we carried out the test – not quite like you’d expect it to be on your boat in the depths of winter unless there’s a freak warm spell. The test conditions therefore favoured the compressor models, but from experience gained in a past PBO test undertaken in much cooler conditions, the amount of water collected by the desiccant models outstripped the compressor types by a factor of two. There is no doubt about the efficacy of the desiccant models in cold weather, but the compressor models do the job for just a third of the power consumption – though they’ll be much less efficient in low temperatures and may also have to keep stopping to defrost. All the models tested worked well. The Mitsubishi performed best – but then it costs twice as much as the other models. The Ebac and Meaco compressor models both perform well, but provide no view of how much water has been collected – not an issue, of course, if they’re set up to drain into a sink. Of the basic models (Seago, Waveline, XM), the XM has the best carry handle, but the Waveline is the most compact and lightest compressor model and is the best Budget Buy. 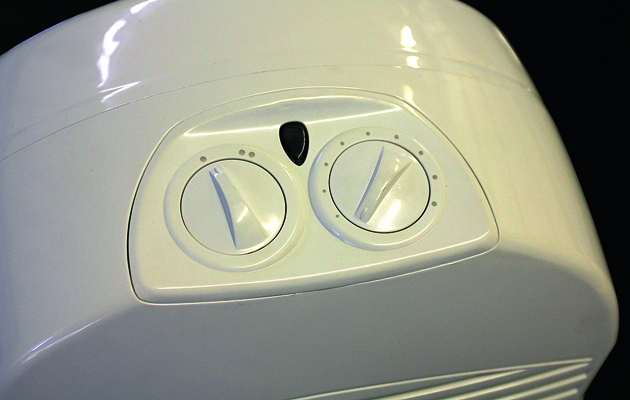 The Meaco desiccant models are the lightest in weight and will perform the best on a boat in winter. Their ability to shut down and periodically sample air should help keep their otherwise high running costs down. The Meaco DD8L Junior model is around the same price as the basic compressor models and wins our Best On Test award for use on a boat in winter.